Lawn care is a funny thing. Just when you think you’ve cracked it, Mother Nature offers up a different challenge. In this blog we’re looking at toadstools in your lawn. Where they come from and how to treat them. Mushrooms and toadstools are types of fungi. You expect to see them growing in woodland and wild places but they can come as a surprise when they appear in your lawn. However, believe it or not, they are a sign that your lawn and the soil beneath it are a healthy ecosystem. Let me explain. Fungi are living things, they are neither plants nor animals but have a class all of their own. There are millions of different species of fungi in the world, including the microscopic ones that cause lawn diseases such as red thread and Fusarium patch. Some fungi are easy to see, others are invisible to the naked eye. But just because you can’t see them, it doesn’t mean they’re not there. These amazing organisms have a big job to do in the world. They help to break down organic waste and turn it into plant food. In other words, they are recyclers. Some fungi, known as actually team up with plants. They attach themselves to the plants’ roots and physically feed the plant with the nutrients they have made. In return, the plant offers up some of the sugars it has made from sunshine. It’s an amazing partnership that benefits both the fungi and plant. The soil in your garden is teeming with fungi and their spores. You can’t see them, they don’t hurt you and most of the time the spores are dormant, just waiting until all the conditions are right for them to grow and produce the next generation of their species. It’s not unusual to see toadstools in newly laid turf, especially in autumn time. Don’t worry, they’ll soon disappear. If you have mushrooms or toadstools in your lawn, take it as a compliment. It means that the soil is nutritious and has a healthy ecosystem. The fungi you sometimes see in the lawn have larger fruiting bodies than their microscopic cousins. The spores (spores are the fungal equivalent to seeds) of these species tend to stay dormant in the soil until they have the correct temperature, amount of moisture and a suitable food source all at the same time. Most years, that time is autumn. This year (2018) it’s come a bit earlier. Nature never looks at the calendar. The weather this year has been odd to say the least. We had late frosts, then a very wet spring, followed by an incredibly hot dry summer. Seeds and spores tend to be triggered by weather patterns and some are uber-sensitive to them. Fungal lawn diseases and wild mushrooms are at their most prolific in autumn. My guess is that the weather tells them when summer is coming to an end and it’s time to grow fruit and send out new spores. It’s not unusual for toadstools to appear in the newly laid turf. That’s because the spores have been disturbed during the harvesting and transporting of the turf and they’re enjoying all the water you’re giving them. During my training, I learned that there are around 400 different species of mushrooms and toadstools that grow in lawns. So far, the ones that have been tested haven’t been poisonous. BUT unless you are an expert in mushroom identification, it would be sensible to assume that the mushrooms in your lawn are NOT edible. 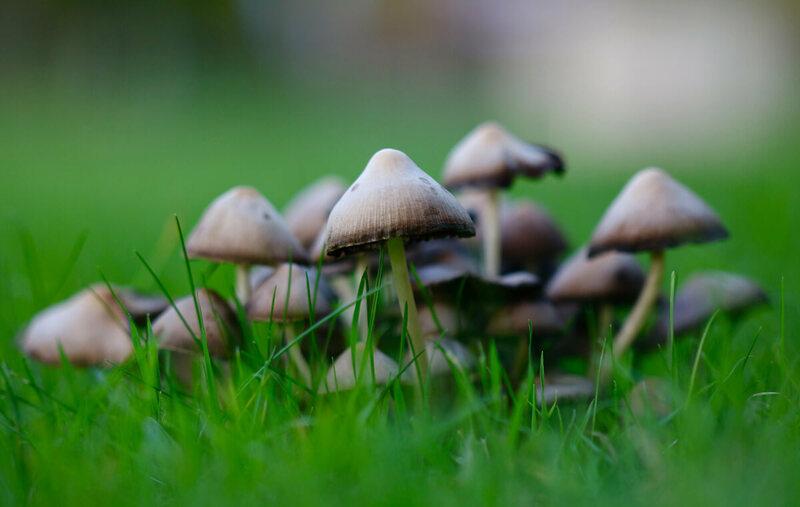 If you have children or pets who are likely to eat the mushrooms or toadstools, then it’s a good idea to either pick the fungi and throw them away or restrict access to the lawn. You will rest easier if you know they’re not being devoured. First of all, don’t panic. The life of a toadstool can be measured in days not weeks. They are very short lived and if you leave them alone, they will disappear on their own as soon as they have distributed their spores and completed their life cycle. Spores are carried in and out of the garden on the wind. (Another possible reason why fungi tend to fruit in autumn time). You cannot keep the spores out and there’s no guarantee that they will grow into mushrooms next year. They could stay dormant in the soil for years and years. So don’t drive yourself mad trying to destroy the mushrooms before the spores escape. You may not gain much from it. Mowing the lawn will usually destroy the fruiting bodies. You may see a second or even a third flush of them, depending on the weather but you can mow again to get rid of them. What can you do to avoid mushrooms next year? Scarifying and aerating your lawn in autumn will get rid of most of the fungal spores that are hiding in the thatch layer. 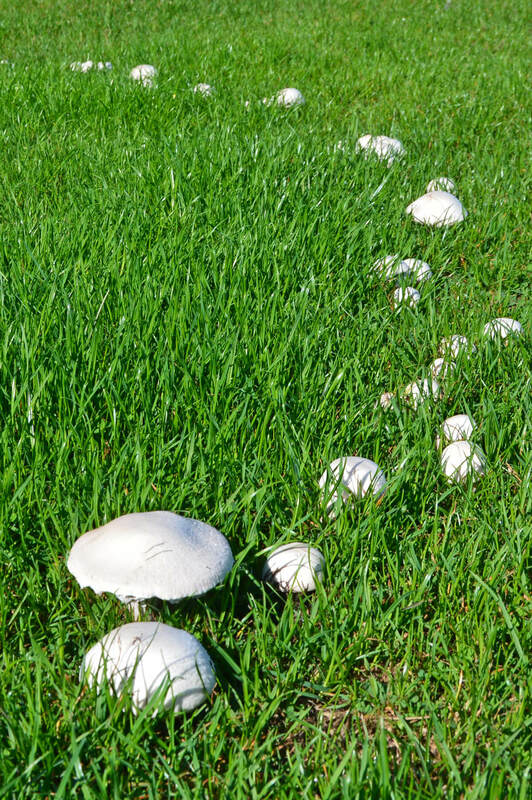 Keeping your lawn well fed will ensure that there are fewer spaces between grass plants for a mushroom to grow in. Keeping trees, hedges and shrubs well-trimmed will help create a microclimate on your lawn that doesn’t suit fungi. Remember that fungi, in general, seem to favour places that are cool, damp and poorly ventilated – like woodland edges. The important thing to remember though is that your lawn is to be enjoyed. For it to be healthy it needs a strong ecosystem in the soil beneath it. Changes in moisture levels and temperatures will change the balance in the ecosystem and may throw up some surprises for you. It’s all part of the challenge of growing a beautiful lawn and I’m always on hand to help you meet that challenge.